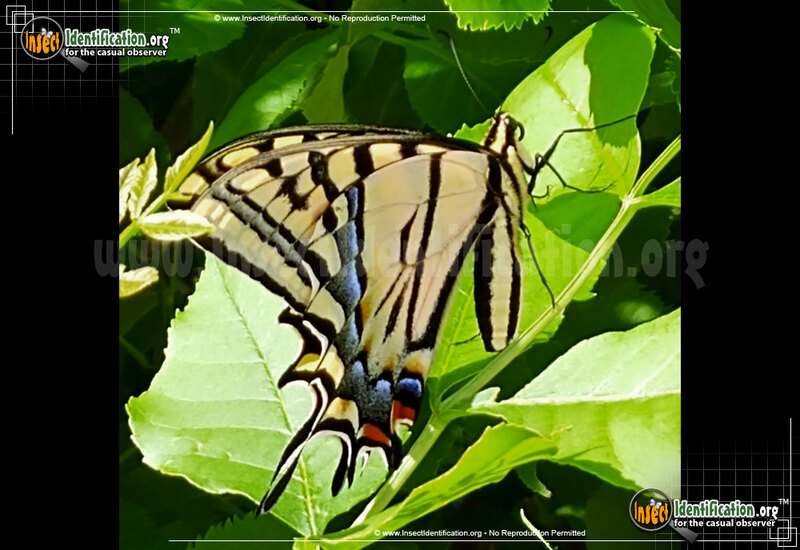 Detailing the physical features, habits, territorial reach and other identifying qualities of the Two-Tailed Swallowtail. A popular Tiger Swallowtail west of the Mississippi River, the Two-tailed Swallowtail is blessed with an extra pair of extensions at the tip of its hindwings. Technically one could argue that the Two-tailed Swallowtail has four tails, but the name counts the number of tails per wing, not in total. Like other Tiger Swallowtails, this species is yellow with black stripes, creating a visual resemblance to the great jungle cat. The thin black stripes are longest near the body and get progressively shorter toward the tips of the wings. The hindwings are scalloped and imbued with shades of iridescent blue and burnt orange at the center line. A long and short tail flank the bottom edge of each hindwing. The Two-tailed Swallowtail is one of the biggest butterflies found in the western part of the continent. Caterpillars have yellow faces and are fleshy and green when young. They are wider at the head and neck than at the rear. Small eyespots behind the head are followed by a white and black collar. Tiny light blue/lavender dots ring the segment before the collar, but there are more on the third through sixth segments after the collar. Caterpillars of this species are usually found eating the leaves of chokcherry, hoptree, and ash trees. Adults are found near water sources like streams and creeks. They drink flower nectar and can be spotted on blossoms as well as in flight. They are active spring through autumn. Look for them in canyons, woodlands, and areas with moving water.